If you want life to be happier, you must adjust your attitude. It’s how you deal with stress that determines how well you achieve happiness. Students shouted out answers ranging from a couple ounces to a couple pounds. Let this professor’s words be your wake-up call. The key is to realize that the worries, frustrations, and stressful thoughts you’re dealing with are entirely a product of your own creation. And you can let them go almost instantly by adjusting your attitude. Today, I challenge you to do just that – to replace your negative thoughts with positive alternatives. Take a look at the quotes below that I’ve carefully selected from our blog’s archive. Pick one (or more) of them that relates to your present circumstances, and use it as a mantra by repeating it to yourself the moment you feel negativity creeping up inside you. Most people make themselves unhappy simply by finding it impossible to accept life just as it is presenting itself right now. Be mindful. Happiness doesn’t start with a better relationship, a better degree, a better job, or more money. It starts with your thinking and what you tell yourself today. You may not be able control all the things that happen to you, but you can decide not to be reduced by them. When you are no longer able to change a situation, you are challenged to change yourself. And doing so, in turn, changes everything. You alone get to choose what matters and what does not. The meaning of everything in your life has precisely the meaning you give it. Worrying never changes the outcome. Breathe more and worry less. Train your mind to see the lesson in every situation, and then make the best of it. Be selective in your battles. Peace always feels better than being right. You simply don’t need to attend every conflict you’re invited to. Even when you are upset, don’t be hateful – keep your heart and mind wide open. Peace is not the absence of pain, but the presence of love. Just wish people well, even if they’re rude to you. Embracing their negative energy only harms you at the end of the day. Smile and move forward. Happiness and a negative mindset can’t co-exist. Those who move forward with a positive attitude will find that things always work out better. Truth be told, we either make ourselves miserable or we make ourselves strong. In the end, the amount of work is the same. When you really pay attention, everyone and everything is your teacher. Take time to observe and listen. Take time to learn something new. We learn the way on the way. Let go of everything from the past that does not serve you, and just be grateful it brought you to where you are now – to this new beginning. Think of all the hundreds of thousands of steps and missteps and chances and coincidences that have brought you here. In a way it feels like the biggest miracle in the world, doesn’t it? Letting go isn’t about having the ability to forget the past; it’s about having the wisdom and strength to embrace the present. Sometimes you simply have to stop fretting, wondering, and doubting. Have faith that things will work out, maybe not how you planned, but just how it’s meant to be. Above all, the mantras in this post collectively serve as a healthy coping mechanism for life’s inevitable disappointments. And understanding how to cope in a healthy way is an invaluable skill. How you cope can easily be the difference between living a good life and living a sick one. If you choose unhealthy coping mechanisms like avoidance or denial, for example, you can quickly turn a tough situation into a tragic one. And sadly, this is a common mistake many people make. When you find yourself facing a disheartening reality, your first reaction might be to deny the situation, or to avoid dealing with it altogether. But by doing so you’re inadvertently holding on even tighter to the pain that you wish to let go of – you’re, in effect, sealing it up inside you. Let’s imagine someone close to you has grown ill, and supporting this person through his or her illness is incredibly painful. You might not want to deal with the pain, so you cope by avoiding it, by finding ways to numb yourself with alcohol and unhealthy eating. And consequently, you grow physically ill too while the pain continues to fester inside you. If you notice yourself doing something similar, it’s time to pause, admit to yourself that you’re coping by avoiding, and then shift your focus to a healthier coping mechanism, like using the mantras in this post to help you open your mind. When you face struggles with an attitude of openness – open to the painful feelings and emotions you have – you find out that it’s not comfortable, but you can still be fine and you can still step forward. Openness means you don’t instantly decide that you know this is only a horrible experience – it means you decide that you don’t really know what the next step will be like, and you’d like to understand the whole truth of the matter. It’s a learning stance, instead of one that assumes the worst. A task is harder than you expected it to be — Instead of running from a daunting and overwhelming task, you can accept it and see what it’s like to feel uncomfortable and overwhelmed, and still take action anyway. Writing a book, for example, is daunting and overwhelming, but you can still write one even with those feelings rolling through you (just like Angel and I did with 1,000 Little Things Happy, Successful People Do Differently). An interaction with someone you love angers or frustrates you — Instead of lashing out at a loved one when you’re upset with them, you can sit quietly with your difficult feelings and just be open to what it’s like to feel them. And then, once you’ve had a moment to breathe, you can see what it’s like to deal compassionately with someone you love who you’re also upset with. To try to understand them instead of just judging them at their worst. You are forced to deal with a loved one’s death — When someone you love passes away, the grief and sense of loss can seem overwhelming. And at that point, it’s incredibly easy to give in to unhealthy, “quick-fix” ways of alleviating the pain. But you have to force yourself to do the opposite – to give yourself compassion, to sit with the powerfully difficult thoughts and feelings you have, and to open your mind to what lies ahead. Gradually it becomes evident that death isn’t just an ending, but also a beginning. Because while you have lost someone special, this ending, like all losses, is a moment of reinvention. Although sad, their passing forces you to reinvent your life, and in this reinvention is an opportunity to experience beauty in new, unseen ways and places. And of course, we’ve merely just scratched the surface of an endless pool of possibilities for healthy coping. The key thing to understand is that by learning to cope in healthier ways, you will find that you can better handle anything life throws your way, and come out stronger, and oftentimes even happier, than you were before. Think how you want to live today. How has adjusting your attitude affected your life and circumstances? What else do you try to keep in mind to strengthen your mindset and cope more effectively with stress or pain? We would love to hear from you. Please leave a reply below. Boom! Another powerfully written article! I’m glad I found your blog and teachings last year and signed up for your emails. I’m now using many snippets from your articles and your book as morning affirmations. Your words tend to remind me of the lessons I know but so easily forget. And each time I read them I see another aspect of meaning in what they say. The mantras you’ve listed in this article will be added into the rotation starting tomorrow. And to answer one of your questions – what else do I try to keep in mind? I worry that I’m not good enough – it’s a constant pulse the aches in the back of my head. So I have to remind myself daily that I AM good enough. And I’m getting better at beating this negative thinking pattern, day by day. Thank you for giving me a new healthy coping mechanism. When my attitude about something I can’t change is driving me nuts, I do have the tendency to avoid it or bury it, sometimes with alcohol, just to forget and feel better for awhile. But this post really opened my eyes to what I’m doing. Anyway, thank you and please keep sending these insightful posts to me via email. They are slowly changing my thinking and attitude about everything. I’m kinda like Michelle above–it really helps to have positive reminders, which is why I have read and re-read your parts of book and many of your articles several times over the past year. Doing so has helped me stay on the right path. Also, one of the key things I’ve been working on recently is to stop my negativity is the self-inquiry process you covering with me via your Getting Happy course. This process combined with regular reminders have been the source of my inner growth. Anyway, I just wanted to leave a comment to say thank you. Keep up the good work. You’re changing a life over here. But at 60 now my life has to move forward to happiness and begin a new turn. I need to take care of me. I am tired, I am worn, I am exhausted, I am unhappy and need to live each day to its fullest. Recently, I experienced and I’m continuing to experience perhaps the worst conflict I have encountered in my professional life. For weeks, the situation has gone unresolved (and the resolution is really out of my control), and one day I stopped to take stock and realize that I had gained weight, was fatigued like at no other time in my life, and that my family and my relationships were suffering, as was my productivity and all other areas of my work life. I finally decided that the only thing I could control was how I respond to the situation. So I put into practice numbers three and five from above. I found that not only have I been able to achieve a modicum of peace, but that has also had a ripple affect on my team. Thank you for this great post. I completely agree with Michelle’s comments. Your blogs and emails resonate with me very much and I find them to be very inspirational. I like the simplicity of the mantras, it makes them all that much more meaningful. I often find that whatever topic your email addresses, it coincides with things that I am struggling with or find useful to be reminded of. So thank you for creating your blog and for sharing the knowledge that is helping me get through a very difficult time. An amazing read and so many brilliant points! Thank you. Thanks so much,your articles have made me a better person.I now can see using my mind.keep up the good work.the world will be a better place if a lot of people read these articles.lam even happy to share them with family and friends. Thank you for this timely message. I’ve been holding my glass of water too long! I need to let go of it today. Sitting with and processing uncomfortable thoughts/emotions then moving forward instead of reaching for a glass of wine or box of cookies was very powerful words for me to read this morning. Process, keep One’s peace and move on. Thank you. This articles are tremendous impact of one’s life if he/she really intends to change their inner growth and help us to keep in the right path. I have had a difficult past. I have been through things some awful stuff. I moved to another state so my past would stop haunting me. While I was gone I felt like I could finally live in peace. Unfortunately I went through a financial struggle. Something happened beyond my control. I didnt want to move back home..because I was so afraid of remembering my horrible ….painful past. Well, my fiance talked me into coming home. He said he would even come to my hometown with me. Since I have been home my past has haunted me again. I hate being here. I cam doing everything I can to move back out of town with my fiance and our son. But meanwhile as I plan and execute my goals…I have tried stay focused and motivated….I have to ignore the hurt and pain of being here….. …but as I try to move forward mentally…my dad whom comes in and out of my life…keeps bringing up my past! I have asked him to please stop…he stopped for a little while and then he brings it up AGAIN. Honestly because of that….secretly I HATE talking to him…i plan to use those mantras as I plan on leaving AGAIN. Your emails are so very awesome. I am going thru a separation with my wife . I have spent so much of our marriage trying to make things right for her . Feeling like I never could achieve ” atta boy ” when in reality it’s not my job to make her happy as “Mr fixer , uh that’s me ” can only fix himself and I’m really working on throwing out the tapes that play in my head about how it’s all my fault. I have been inviting her out on the dance floor with no luck . The band still plays and therapy says ” quit chasing stand still create a vacuum . I needed today’s email with the Mantras which hit me dead on . I have no choice as to take them and live by that mindset . Thanks again , you guy’s are God sent. When I’m tempted to be OFFENDED by something I or another has done, I try to OBSERVE it without judging – Hmm, what was going on to create that response? Then I OFFER what I see back to God and OBEY in what I feel I want to do differently. Very helpful when I’m mindful enough to use it! Mind blowing!! Your articles are magical! Lucky to have found your blog. Most times we aim for the sky but forget those tiny little things on the ground which actually is our true happiness. Your article s are a constant reminder of those easily forgotten moments. I am actually saving all your article’s to pass it on to my next generation! Keep continuing! Best wishes. What a great and in-depth article, with helpful tips and reminders! I scanned the article this morning and intentionally browsed back to your site tonight to read it… Because I needed it 😉 Great work guys! Thank you so much for sharing all this wisdom with us! 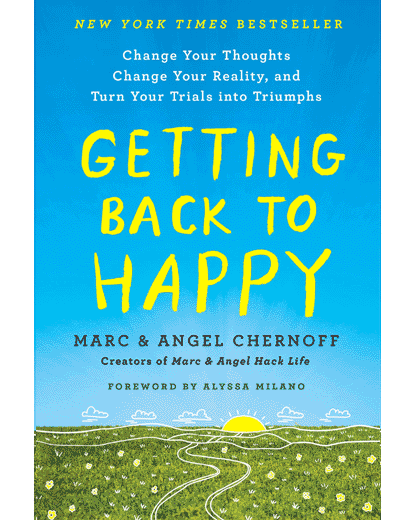 I recently signed in on your course ‘ Getting back to happy ‘ and it is amazing!! It really works! The actions you suggest are realistic and helpful. It is always hard to bridge the knowing – doing gap and now I finally start acting!! Also the way you learn us how to think and refocus on a situation is really mindblowing. Even this morning I faced a setback and instead of going of in an negative spin and start complaining, I managed to sit back, breathe and say to myself: how will this negative attitude bring me closer to a solution? Will I feel better lashing out? No! Quite the opposite, I would feel a lot worse and I would not even have come one step closer to a solution. This has only become possible thanks to your course. I have started the meditation as you, Angel, taught in the video and it is hard work and it does not always go the way I would like it to go but I am learning and working every day to become better at it. The daily rituals and the setting of smaller goals to ultimately achieve the bigger goals are really helping me forward. I also write in my journal every evening to remind me of the happy moments of the day! So again: thank you, I am a big fan and I am looking forward to still learning a lot from you!!! A very encouraging article. I am struggling with divorce and all of the fears associated with it. I’ve made mistakes that I regret and have a hard time forgiving myself. I cannot change the inevitability of the loss of the marriage but I am trying to forgive myself and realize it takes two to make and break things. I pray for the strength to get through it and articles of this nature offer encouragement, thank you. Marc and Angel, thanks very much for this guidance. I’m going thru though times and your words have been helping me so much. Love the glass of water analogy. It is the perfect metaphor for the things that drag us down in life. At first, they seem easy to handle and maintain but let them linger around long enough and they will beat you into submission. No matter the time, the methods of coping you have laid out will be a great help to so many, myself included. I agree. The water glass comment resonated with me. I’m the gal that keeps holding it up, it gets heavier and heavier. I need to stop doing that. A good read Marc and Angel. Thanks for your brilliant points. Thank you Marc and Angel. I hadn’t visited your site in a while as I’d been very busy. Then, this morning I could feel uneasiness and anxiety creeping in; I’d had a vivid dream where I saw my husband and it was such a beautiful moment. He left me last August…just got up and left. We’d had problems in the past (due to his issues- he was suffering from PTSD because of things that happened in his childhood) . The day before he ended things, we’d gone out for dinner and romantic walk. Everything was wonderful. Then, he had an argument with the kids and I got drawn in. That was it. He decided everything was over. He refuses to talk or even answer my texts. I was so hurt, I just become numb. I’ve been married for 16 years and been his rock. It will be one year in around 2 weeks since he just decided to give up on me and the kids. I’ve been thinking of giving up and resigning myself to the fact that it’s over. Having that dream really disturbed me. I try not to think about him too much…it’s like the glass…it becomes too heavy to bear. It is so hard not to have closure. He told my daughter he loves me a few weeks ago. I text him after that, but he ignored me. I’m tired of all this. He hasn’t divorced me. Howver, I’m married but not married. I can’t think of marrying or meeting someone else because I sell love him. I’ve tried to stop loving him. I’ve tried to think of the terrible things he has done. My heart still remains open and full of love. The last few weeks I’ve been pushing myself to let it go and accept my reality: he will never return. I tried to picture a happier future without him even though my heart feels so sad and pained. And then I had a dream which seemed so real. It’s left me feeling unsettled. I’m struggling to accept the end despite trying so much. I’m normally someone who looks for lessons in everything and try to turn a negative situation on its head. I’m a person of faith and that has helped me through some dark times. I’m productive at work (I’m a teacher), reliable and do a great job as a single mum. Looking from the outside no one will know the pain I carry or how deeply this rejection has affected me…I know though. I just don’t understand how to move on. I read the article and so much hits home. It’ll provide me with relief…for a while. It will be a balm to my wounds…for a while. Nothing seems to heal me though. I’ve tried so hard. Thank you SO MUCH for your inspiring blog, this article in particular. I will re-read it every day. Thank you.